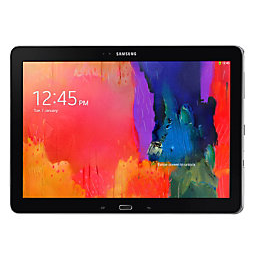 The Galaxy NotePRO 12.2 is two inches larger than your typical beefy tablet, and it's priced to match. The device will soon hit store shelves in the US for a whopping $849.99, over three hundred dollars more than Samsung's own 10-inch Galaxy Note 10.1 2014. Anyone who wants to call dibs on this expensive piece of hardware can do so now at Office Depot. It will become available February 13th. This comes a few days after the NotePRO became available in the UK for £649, which, contrary to how it looks, is even less affordable. But for your buck, you walk away with a 12.2-inch 2560x1600 display, 3GB of RAM, a 9500mAh battery, and 64GB of internal memory. Though the hardware comes with Samsung's Magazine UX interface, don't worry, it still tastes like KitKat underneath.